Police in San Jose on Saturday are searching for two possibly barricaded suspects accused of robbery and assault with a deadly weapon, according to police. David Gonzalez reports. Police in San Jose were unable to locate two suspects who were believed to be holed up in a house next to Oak Grove High School for several hours Saturday, according to police. The search for the suspects, who were wanted for robbery and assault with a deadly weapon, was called off early Sunday, according to police. 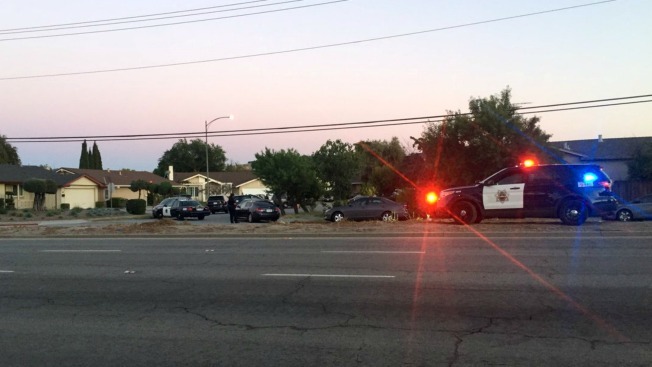 The hours-long search kicked off Saturday evening around 5:45 p.m. when police tried to pull the over near Senter Road and Seven Trees Boulevard, according to police. The suspects, who were riding in a stolen vehicle, refused to stop. A pursuit followed before the suspects fled on foot in the area of Bodie Court and Blossom Hill Road, according to police. That is where police set up a perimeter to help locate the suspects, who were believed to be hiding in a home. People living in the area were instructed to shelter in place. "It's scary," resident Chris Alexander said. "I hope that no one is hurt. That's the first thing that I ever think about is like, you know, if any families are in (the house), hopefully they're not going to be like collateral damage or something." It is unclear if the two suspects were still in a home in the area as of 11 p.m. Units cleared the area early Sunday, according to police.